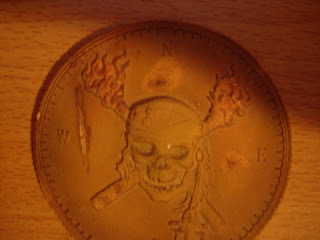 This is an edible pirate coin-like decoration that came with a dessert that I had at the Blue Bayou Restaurant at Disneyland in Anaheim, CA. I saved this decoration because I thought it was too cool-looking to eat. As you may know, the Blue Bayou Restaurant is an indoor restaurant with a great view of the loading area and Bayou of the Disneyland attraction, "Pirates of the Caribbean". Boats from the attraction glide past dining onlookers. Great atmosphere. There is usually a waiting list to get in. Reservations suggested.